I made a great find earlier today, although it was admittedly not in our own woodland. While driving to my parents house I spotted, from the car window, doing 40 miles per hour, a beautiful "Chicken of the Woods" fungus. This is one of the few fungii that I feel confident identifying as it is pretty unmistakable and has no poisonous look-a-likes. It is remarkable as it has a texture and, some say flavour, a lot like chicken. It varies in colour from bright yellow through to browny-orange, and the younger more brightly coloured specimens are the best to eat. The texture feels rubbery and smooth, and the lower surface has no gills. Instead it has microscopic pores on the underside to help it shed it's spores. approx 500g of chopped "Chicken of the Woods"
I'm badly restricted by a food intolerance. I fried up the mushroom with the butter, salt and paprika until it started to soften and release moisture (around 5 minutes in). At which point I added the milk and kind of poached it for another five minutes or so. The result was delicious, eaten with mashed potatoes and cheese, but could just as easily been served over toast. While the chicken of the woods fungus is, in my recent experience, lovely some individuals have been known to have adverse reactions to it. Eat only a small amount for your first time. Also, the fungus is known to fruit year after year from the same spot, provided the organism within the tree isn't damaged, hence it is recommended to CUT the body away from the stump, leaving some flesh still in place. 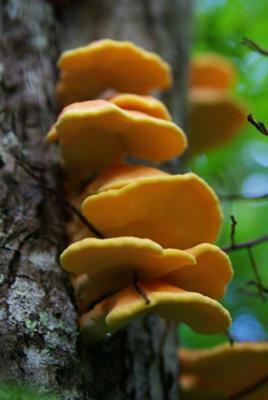 It is supposedly possibly to cultivate "Chicken of the Woods", along with other fungi using spawn to inoculate logs and tree stumps. Spawn can be cloned from wild fungi, by simply chopping pieces of the stalk of the mushroom you are interested in and then giving it a nice moist home in either some cardboard or sawdust. I'm going to see if I can get anywhere with the ends of the fungi I picked today, with a view to getting some logs going out in our own woods. Upon closer inspection. They were tiny worms exploding out of the mushroom. oops. I am sitting here with my Chicken of the woods and it is on a white piece of paper. I am watching what I think is a bunch of spores popping off and flying onto the paper. Pretty cool! Last night I realized they were all over the counter. Now I have the paper down in hopes to maybe cultivate them somehow. That i consider everyone. When getting a good best essay, one must have an extraordinary writer. The writer must be someone who is conversant with the subject matter and who is versatile enough to present information in a n original manner.. Typically the best essay review services are actually written by gurus who've got found past experiences. Typically the offering through articles and other content appears to be further solution and then the penning patterns chosen are actually carried through in the traditional. I just understand typically the properties laid out for you within your put up upto a fantastic novelist mainly because it seems to have lined this unique. To all the nay-sayers... our meal was lovely, with no ill effects. Chicken of the Woods is definitely more meaty than your normal mushroom, but well worth the effort! Join in and write your own page! It's easy to do. How? Simply click here to return to Woodland Diary.